Silver Shoes & Rabbit Holes: Pre-K Begins! The Fancy Nancy backpack was Big Sis's first backpack, purchased for her first year of preschool, in fall 2009. She used it for pre-K, then last year it became Little Sis's. It's such a great preschool backpack, very lightweight but big enough to hold large art projects. Next year, both girls will be in school all day, five days a week. But that's next year. So, it's too early to be sad, right? Further evidence of bigness: the car seat has been converted to a booster. I should have done this a couple months ago, but her height got away from us. And now for a celebratory meal at our favorite bookstore/cafe. David Goes To School by David Shannon. Blue Sky Press, 1999. This post is for Little Sis, so I had to choose a David Shannon book. When she wasn't even two, she became enamored of David Smells!, a Diaper David board book from the library. I think she identified with David. She is my "No" baby. In this book, little David heads to school and is constantly being corrected by the teacher. 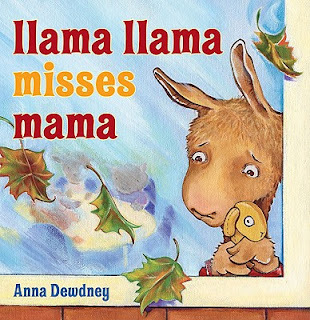 Llama Llama Misses Mama by Anna Dewdney. Viking, 2009. 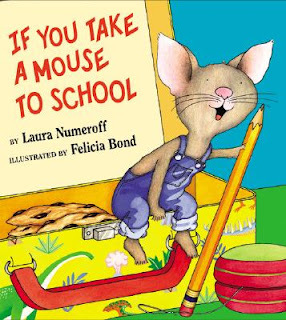 Another school-related title from a successful picture book series. I have to say, in my bookselling days, my Llama Llama storytimes were very popular. In this book, our little llama friend goes to school for the first time. Big Sis chose this book as a gift for her kindergarten teacher last year. She thought it was a "good book for kids who are new to school." Smart girl. And what did Little Sis's pre-K teacher read to her class on the first day? Old familiar favorites. Brown Bear, Brown Bear, What Do You See? by Bill Martin Jr., illustrated by Eric Carle. Henry Holt & Co., 1992. If You Take A Mouse To School by Laura Numeroff, illustrated by Felicia Bond. HarperCollins, 2002. Ah, books. Our family's ultimate comfort food. oooooooh! so so sweet! i love the pic of her soup at the cafe -- I want to go there too! precious! Sadly, she's really obsessed with the foccaccia wedges that come with the soup. I just can't get her to eat any soup when the bread is gone. Thanks! :o) The backpack is still in great shape, and this will be its 4th school year. Thank you, and 'tis true! I love fall, I love school supplies, and hearing about their day and their friends. But my husband made me cry yesterday on the phone, talking about videos he found on his old iPod yesterday of Big Sis when she was just a little baby. It's tough to realize how fast time flies.